I have been struggling with ways to describe this book. Charlie Brown all grown up and even more disillusioned? Garfield meets Sartre? A Larry David comic strip without all the celebrity trappings? A Swiftian misanthropic parody of a daily comic strip? It's not quite any of these things, but what I can say is that I felt simultaneously repulsed and compelled to read this book in one sitting. Daniel Clowes, author of acclaimed works such as Ghostworld and Ice Haven, created this series of 4-panel comic strips in slightly different styles. In them he follows the exploits of Wilson, who does little and is critical of everything. In time, we see him deal with the loss of his ex-wife, the death of his college professor father, the search for a daughter he didn't know he had, and periodically we sort of feel sorry for him. But Clowes punctuates all these moments with a reminder that Wilson is an egotistic jerk who cannot empathize with others. In many ways, his life reads like a stereotypical talk show participant, only he is supremely intellectual and self-important, and the result is a strange mix of humor and dread. Clowes has making comics for the better part of three decades now, with most of his work appearing in independent anthologies and series such as his seminal Eightball. 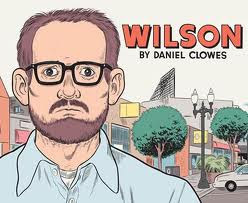 Wilson is his first original graphic novel to appear first in non-serialized form. Clowes has garnered many accolades for his work, winning multiple Harvey Awards for writing, artwork, and individual stories. Two of his works, Ghostworld and Art School Confidential, have been adapted into movies, and he has been working on at least two other screenplays since. Reviews on the book have been somewhat mixed, though they all point to Clowes's skills as a storyteller. NPR's Glen Weldon comments on how Clowes grapples with "bleak truths" and self-laceration but also sheds life on the pomposity and humor of these situations. The Hooded Utilitarian's Ng Suat Tong wrote a very detailed and pointed analysis, ultimately criticizing the book and Wilson's "disjointed urban misanthropy" as "vintage Clowes made simple and unrelenting." Along with multiple spoilers he posts a good number of links to other discussions of the book. Sam Lipsyte reviewed the book for The New York Times and found it a mix of "tragedy and farce" that marks the lead character as a workable symbol for humanity, even if not in a universal manner. As for me, I found the book alternately funny, horrifying, and unsettling, but I also found myself thinking about it days and weeks after I read it. I wouldn't call it a pleasant read but an evocative and thought-provoking one. Tom Spurgeon has a large, in-depth interview with Clowes here. A pdf preview is available here from publisher Drawn & Quarterly. Astro City is set in a comics universe where different versions of familiar faces live. Here, writer Kurt Busiek can do riffs on folks like the Fantastic Four, the Justice League, Spider-Man, etc., but he does a fair bit of his own world-building as well. The Tarnished Angel is about an original character, Steeljack, a down-on-his-luck supervillain who was busted and served 20 years in prison. Covered completely by steel, he has incredible strength and invulnerability. He also weighs about 800 pounds. Older and weary, Steeljack comes home to Kiefer Square, a run down part of Astro City, and tries to keep his nose clean. However, he finds that someone is killing many of his past associates and he takes the job to find out who is behind this plot. Part superhero story, part pulp detective novel, the narrative allows lots of room for Busiek to do the evocative character work he is known for with this series. In many ways, Astro City is a labor of love for everyone involved in its creation. Busiek is a busy writer who has won multiple Eisner and Harvey Awards. He has written many comics for all the big companies, including The Avengers, Spider-Man, Superman, Conan the Barbarian, and Aquaman. Brent Anderson is an award-winning artist active since the 1970s as an underground cartoonist and creator of a number of notable works, including the X-Men graphic novel God Loves, Man Kills. Alex Ross, who paints the covers and has a hand in designing characters, also has considerable input. 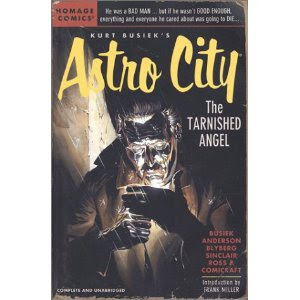 Astro City overall is a well-loved and praised series, and this volume is one of the most beloved. Sci-fi and comics reviewer Mervi called it "a very human and moving story." FRAGAR liked how this series takes familiar archetypes and twists them a bit. Regarding this volume, he found the mystery a bit telegraphed but still enjoyable. The reviews at Goodreads are also very positive. The Astro City homepage is designed like a newspaper and does not feature any previews, but it does give a flavor of what the series is like. 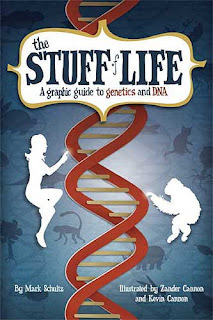 Many of the recent advances in genetics were not too long ago thought only possible in the realm of science fiction, so maybe it is only appropriate that science fiction elements are brought in here to explain scientific theories. This graphic novel (which is more of a graphic textbook, if you ask me) includes the full report of Bloort 183, an alien scientist. He comes from an asexual race of beings who resemble sea cucumbers and are being threatened by disease. In seeking a cure, he is charged with researching how life on Earth works. His report is chock full of information, starting with chemical and biological explanations for how DNA works on the cellular level. From there, Bloort 183's report explains how heredity works, traits get passed on or selected, and how these genetic processes are coming to be manipulated by people. Along the way, many of the major genetic researchers are highlighted, including Darwin, Mendel, Franklin, Watson, Crick, and Thomas Hunt Morgan. Luckily for the reader, the alien monarch who sent Bloort 183 on this mission needs things explained more fully, so what can be dense information gets relayed in more relatable ways. This book is the creation of Mark Schultz and the brother art team of Zander and Kevin Cannon. Schultz has been working in comics for decades, most famously on sci-fi adventure stories like his Xenozoic Tales (aka Cadillacs and Dinosaurs). He has won multiple Harvey and Eisner Awards and is currently writing the Prince Valiant newspaper comic. The Cannons often work together, on books with Jim Ottaviani and Alan Moore, but Kevin has published his own Eisner-nominated graphic novel Far Arden. Zander's most notable solo work is the Harvey-nominated series The Replacement God. Their expert craft and attention to detail are apparent in the artwork. This interview segment on NPR sheds more light on what went into the book's making. Along with this media attention, the book has received mostly positive reviews. John Hogan appreciated the mix of serious science information in a not-so-serious format. Berel Dov Lerner thinks that the book is entertaining and informative, even if it does try to tackle a bit much at times. Johanna Draper Carlson was a bit put off by the text heaviness and amount of technical information, but in the comments section it seems like her critiques may be a function of audience. A preview, video, and other reviews are available here from the book's publisher Hill & Wang. A sequel of sorts, Evolution, is also available from creators Jay Hosler and the Cannon brothers. 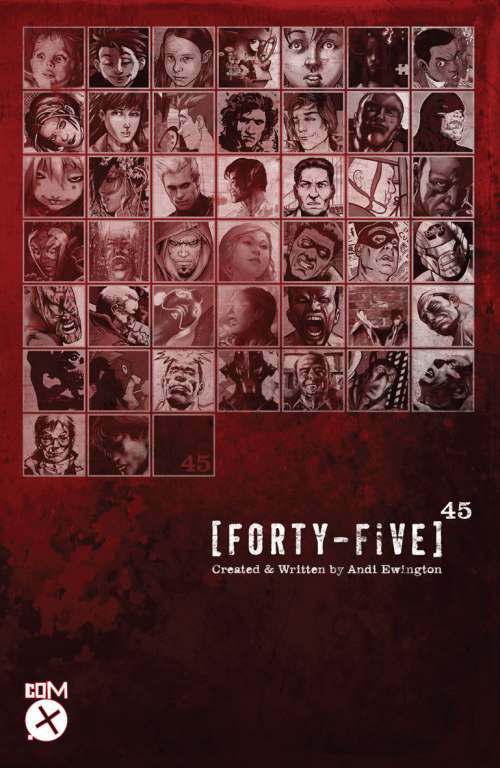 45 is not a traditional graphic novel, though it does offer an interesting take on superheroes and is a beautiful piece of world-building to boot. 45 reads like a compilation of magazine interviews set in a universe where superheroes (here called Super-S, because Marvel and DC have trademarked "superhero," no lie) are real. Protagonist James Stanley is a journalist who is expecting a baby but won't test him to see if he has the super-gene. Instead, he embarks on a mission to interview 45 people and superpeople to get a handle on what living the super-life is like. The interviews are presented in age order, so the first interview is with parents who know their baby will have superpowers. The interviews that follow show a great range of lives, from children with overbearing parents to young people finding their place in the world. The interviews then move on to vigilante heroes, heroes-turned-villains (called Vaders), government and corporate agents, and retired Super-S. Each interview covers a page and faces a picture/comic done by individual artists to suit the text. Instead of reading as a set of unconnected interviews, the flow of the book across the lifespan makes it seem more of a narrative. A common thread of the shadowy XoDOS corporation, which plays a potentially sinister roles in raising, creating, and managing Super-S, also provides a narrative consistency. Andi Ewington is more known as a graphic designer than a graphic novelist, so perhaps his design choices should come as no surprise. He keeps a blog about this book and his more recent activities here. Ewington has conducted a number of interviews about his work on 45 and creating a new superhero universe, including this one on the Forbidden Planet International blog, this one from the Graphic Novel Reporter, this one with Comic Book Resources, and one more at Techland. Reviews about this book have been overwhelmingly positive. Elisabeth at ComicList wrote about how the range of artists and interviews provide a rich view of a diverse, complex cast of characters. Edward Kaye gushed that this book "is by far one of the most original and innovative graphic novels ever created." Richmond Clements noted that while not all of the interviews are great, especially when compared to some of the exceptional ones, he found this a great piece of compressed storytelling. He also heaped the following praise on the book: "Ewington has created something remarkable here. And not only remarkable, if there is any justice this will also become an important book in the superhero genre." 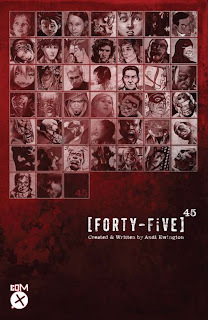 45 was published by the independent British comics company Com.X. A preview interview can be found at Bleeding Cool. A preview of the artwork can be found at Hypergeek. 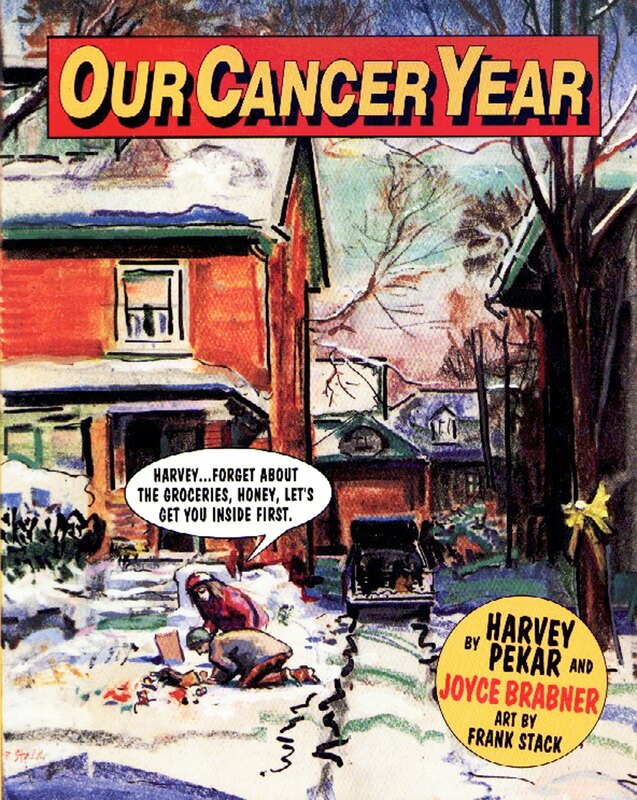 Harvey Pekar was the first substantial autobiographical comics creator. His comic book American Splendor was published for decades, and he gained fame from his appearances on Late Night with David Letterman and, eventually, the movie based on his life and comics. This particular book is an extension of his comic books, telling the story of a harrowing year. It begins with a move from a cozy apartment into a new house, and there is trepidation about the new living arrangement that rattles both Harvey and his wife, Joyce. On top of this situation, Joyce is involved with a group of young activists from the Middle East and Cambodia who are dealing with the escalating political situation that turns into Operation Desert Storm. Amidst all this turmoil and tension, Harvey is diagnosed with lymphoma. Much of the book chronicles his struggles with cancer and the treatments he received. Pekar does not sugarcoat what he went through. He vividly describes his agony, the weakness caused by the chemotherapy, and the anxiety he felt when he could not receive treatments because of his low T-cell count. What is more, he is a difficult patient to deal with, and there are many times he wishes for death. The difficult emotion situations are given excellent treatment by Frank Stack, a long-time American Splendor contributor. Stack has had an interesting and varied career, known for his underground comix as well as works in a much more academic and fine arts vein. Here, his expressionistic work and use of negative space creates a great range of tones and fluidity. 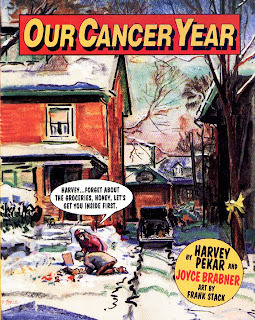 Our Cancer Year was awarded the 1995 Harvey Award for Best Graphic Novel of Original Work. Reviewer Todd VerBeek commented that he was disappointed with some aspects of the book but admitted it is full of "devastating and encouraging" moments. John Hogan wrote that like in much of his other work "Pekar is able to find the glorious in even the most mundane traits of mankind." J. Stephen Bolhafner called it "deep" and "meaningful" as a story of illness, courage, and love. This book is published by Running Press and a short preview is available from Amazon.com. More of the book can be seen at Google Books. 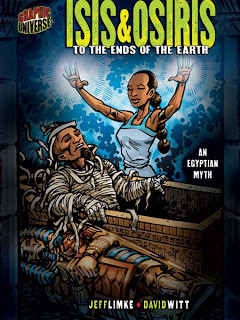 This retelling of the ancient Egyptian myth of Isis and Osiris is rendered in dynamic fashion by David Witt, an accomplished artist whose work has shown up in t-shirts, comics, rock posters, Guitar Hero II, and art exhibitions. The narrative was laid out by Jeff Limke, a frequent contributor to Lerner Publishing's Graphic Universe imprint. Limke has worked in comics for a long while, as chronicled in this interview, and has also been a high school teacher. The myth presented here deals with Isis and Osiris , who are wife and husband as well as sister and brother, having to contend with their jealous brother Set. Set tricks Osiris into a sarcophagus and kills him. Isis finds his body and sets out to resurrect him, but Set discovers this and cuts his brother into 14 parts and scatters them about. Isis eventually recovers most of his body and brings him back, much in the same fashion of the Egyptian mummification process. After defeating Set, Osiris becomes the final judge in the afterlife, determining who is good and evil. As with other books in the Graphic Universe series, there is a glossary, pronunciation guide, and other resources that would be helpful in using this book with students. It has received decent ratings on Goodreads and Amazon. The editorial reviews on Amazon, from Booklist and The Bulletin of the Center for Children's Books, point out some story drawbacks as well as the vivid artwork and their potential appeal for young readers. A preview is provided by Lerner Publishing.